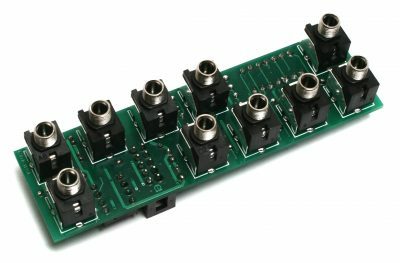 Thank you for purchasing the Synthrotek purchasing the 1U UniBuffer Kit! 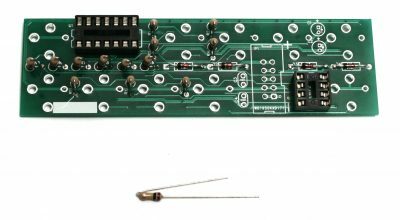 This is an intermediate build as it has many stand-up resistors and tight soldering. If you feel like you can do it, please proceed! If not, get some help from a friend with experience or purchase a fully completed unit. Start with the diodes as shown below, then set over a firm surface to solder, then clip your leads. Diodes are polarized components so you must match the black stripe on your diodes with the white stripe on the PCB silkscreen. Place the IC sockets by aligning the notch with the notch graphic on the PCB silkscreen. Turn over on a flat surface and solder into place. The resistors on this build need to be installed standing up. It is helpful to bend over one of the resistor leads first before populating each resistor. Solder and clip leads. Now marry the PCB and the panel. The panel can accidentally be oriented upside down, so make sure that the serial number on the PCB faces downward. The serial number on the PCB should be behind the buff mult part of the panel. 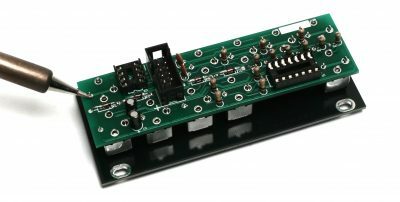 There are 4 inputs that are capable of mixing / summing AC signals (audio) and/or DC signals (gates, triggers, CV). Start by plugging in an AC signal from the OUTPUT of an oscillator, sampler, percussion module, or any other module that outputs audio into the UNITY GAIN MIXER’s INPUT section (top left of module). Take a second AC signal plug it into the next INPUT on the UNITY GAIN MIXER. Both signals should now be summed together, and you can monitor this by taking the OUTPUT and running it into the INPUT on a mixer. Now test the other 2 available INPUTS on the UNITY GAIN MIXER by either moving the two AC signals over or by plugging in two other AC signals from other sources. Start by plugging in a CV signal from an envelope, LFO, sequencer, or a MIDI to CV module into the UNITY GAIN MIXER’s INPUT section. It is best to start with the jack on the far left side. 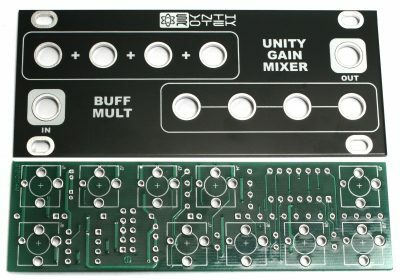 Take a second DC signal and plug it into the next INPUT on the UNITY GAIN MIXER. Both signals should now be summed together, and we can test this by running the OUTPUT into the 1V/O INPUT on an oscillator and monitoring the frequency changes that the summed DC signals are causing. Now test the other 2 available INPUTS on the UNITY GAIN MIXER by either moving the two DC signals over or by plugging in two other DC signals from other sources. By now you should be able to confirm that all INPUTS and OUTPUTS are working correctly on the 1U UNIBUFFER and that the UNITY GAIN MIXER section is working correctly with both AC and DC signals. Plug a cable into a 1V/O INPUT on an Oscillator and plug the other end of the cable into one of the BUFF MULT’s OUTPUTS (bottom right section). It is best to start with the jack on the far left side. Make sure that each of the 4 OUTPUTS are all making precise copies of the INPUT signal by monitoring your Oscillator’s OUTPUT. Plug a cable into a 1V/O INPUT on Oscillator #1 and plug the other end of the cable into one of the Buff Mult’s OUTPUTS. Plug a cable into a 1V/O INPUT on Oscillator #2 and plug the other end of the cable into one of the other available OUTPUTS. From here it’s best to get both Oscillators in tune with each other so you can hear them both reacting the same way to the INPUT signal. Make sure that each of the 4 OUTPUTS are all making precise copies of the INPUT A signal by monitoring the OUTPUTS from both Oscillators #1 and #2. By now you should be able to confirm that all INPUTS and OUTPUTS are working correctly on the 1U UNIBUFFER and that the BUFF MULT section is working correctly.